The concept of The Arts Olympus evolved through years of global networking established by the International Salon Society of the Arts (ISSA) an organization founded Robert Slaughter. Years of arts activities had created an outstanding base for the launch of the Arts Olympus. ISSA under the direction it’s founder has been dedicated to encouraging the arts and bringing together, through free art salons, the hearts and minds of countless people in all parts of the world. Robert Slaughter, was influenced originally by the great turn of the century salons of Paris where painters would meet to exhibit and discuss their art. He started by inviting artists friends to congregate in small cafes, later his salons grew to all proportions and drew people of all walks of life. It would finally come to the point that the locations had to be large enough not only for those attending, but also to accommodate live performances. He now tries to find interesting locations that act as a unique backdrop for each event. Therefore, no two salons are identical. The salon could include an exhibition with poetry, a dance concert, or jazz on the roof. He has had countless locations, everything from a glass pavilion in Bangkok, a 14th century tower in Germany to a top floor of a Rockefeller building in New York. Now the Arts Olympus has seasoned into it’s own unique arts institution with enormous draw attracting people of all ages, races and nationalities. Educating, encouraging and exposing young people to the arts has been very high priority through the years. The Arts Olympus has been instrumental in getting children into theaters, exposing them to music, dance and to realize their total creative potential. Operating on an unbelievably low budget the Arts Olympus has been known to create miracles by simply being creative, by creating an art project for kids out of found objects, by capturing free live theater seats for kids and their families to guarantee the producer a full house for opening night, by assembling an all volunteer “wow” event that money simply could simply not produce and the list continues to grow year after year. The Arts Olympus has partnered with many institutions. At the United Nations we created a wonderful ensemble of talented young ethnic musicians to perform for the United Nations Correspondence Ball that were the talk of the town the next day. This was an enriching and encouraging experience especially after receiving a standing ovation which had the young musicians beaming with pride and self confidence. The night was full of bragging and hugs form proud parents. An other event took place in a halfway house for the mentally challenged. The Arts Olympus wants to enrich everyone’s life. That evening we co-created a wonderful evening of inventive performances and improvisational comedy theater that had both clients and invited audience howling with laughter. The evening was a huge success. Prior to that event, also for the mentally challenged, we gave a first class art exhibit in a classy New York gallery where the editor of “Art in America“ gave a wonderful speech on how important art is in all of our lives. An international children’s conference took place in Stockholm, Sweden where the Arts Olympus participated in airlifting a number of deserving kids to present a beautiful multi color mural to the children of the world. They met with children from all cultures and was an experience never to be forgotten. Upon returning home, many of the kids gave talks at their schools describing this unique experience. One kid became somewhat of a celebrity by appearing on local TV news and radio. The Arts Olympus simply never stops. Always looking for opportunities to expand opportunities we were once given the use of a grand estate to operate out of. Putting our thinking caps on, we created the first “Cultural Embassy” where we planed events and hosted Cultural Ambassadors from around the world from Maestro Ling Tung of China to the Prima Ballerina of the Metropolitan Opera, New York. This brought the Arts Olympus up to a new level where just successfully hosted a four day world press launch on the most famous ship in the world the Queen Mary. The Los Angeles Times rated the event four and a half stars out of five. Now, we set sail on a seven day inaugural voyage out of New York to Bermuda to be followed by our global voyage the following year to cities around the world. Having once occupied a grand estate, with 17 acres of formal gardens, the Arts Olympus was able to create the first International Cultural Embassy. Tragically, due to problems beyond our control, we were no longer able to operate from the estate. An Embassy with no politics, the purpose of our institution was to create a platform to help embrace, educate and unify people of all ethnic backgrounds. 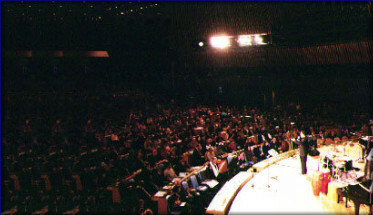 We hosted individuals and events in the form of intellectual gatherings where people of all countries could enjoy meeting, communicating and nurturing new friendships. This help to set the platform for future negotiations that have proven quite valuable. We continue to develop our ongoing activity that brings us closer to launching the most powerful cultural institution in the world that will tour the globe, bringing a better understanding of all people and all cultures.